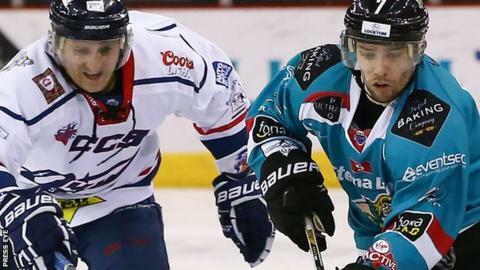 The Belfast Giants ended a four-game losing sequence by coming from behind to beat the Dundee Stars at the SSE Arena on Tuesday night. It leaves the Giants still fifth in the Elite League table, 11 points behind leaders, the Cardiff Devils. Belfast's Mike Radja, Mike Forney, Brandon Benedict, Jonathan Boxill, Chris Higgins and Kris Beech were on target. Scott Brannon scored both for the sixth-placed Stars. The Giants play the Nottingham Panthers in Belfast next in a league clash on Friday night. The Stars, level on points with Belfast going into the match, stunned their hosts on the very first shift on the ice at the SSE Arena when Brannon scored after just 32 seconds. But Belfast hit back through leading goal scorer Radja with just under a quarter of an hour played. Brannon grabbed his second of the night to restore the visitors' lead but the Giants equalised once more when, with the home side shorthanded, Mike Forney was put through one-on-one by player-coach Derrick Walser and coolly slotted the puck past netminder Trevor Koenig for 2-2. Belfast then took the lead for the first time when Benedict pounced on hesitation from Dundee to finish, unassisted, with the Giants once again shorthanded. The Giants went on to dominate the final period with Boxill tipping in an Adam Keefe shot before Higgins scored with a wonderful solo effort in which he completed a lap around the Dundee goal before nonchalantly pushing the puck past Koenig. Beech completed the scoring with the sixth two minutes from the end.